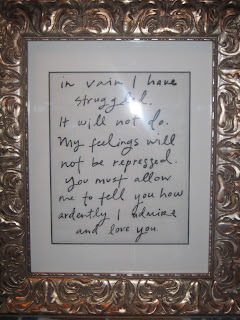 Those famous words written by Jane Austen, immortalized through her character, Mr. Darcy. 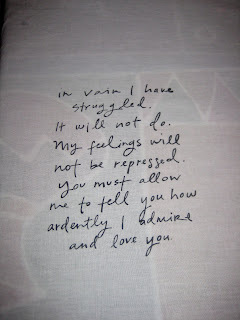 My mom loves literature, and of course, Pride and Prejudice. I came across this dishtowel in an etsy shop HERE and knew this would be a great gift for my mother's birthday. The pattern underneath the dishtowel is my mom's tablecloth. The dishtowel is thin and white. I knew my mom wouldn't ever use it as an actual dishtowel, and since she recently remodeled her master bedroom, we decided to find a suitable place for it in there. It's appropriate considering she does most of her reading in bed before she goes to sleep. First, we ironed the dishtowel. We found a great picture frame and cleaned the glass. 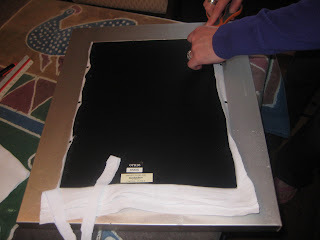 There are more complicated and maybe better ways to do this, but we just wrapped the dishtowel around the back of the frame and cinched it into place with the little tabs. 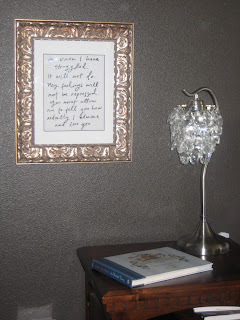 We cut away the extra fabric so it would hang nicely against the wall. Simple as that. She loved it. I knew she would like it, but I was pleasantly surprised by how much she really loved it. It's such a good feeling to know you bought a gift for someone that they will really, truly enjoy for a long time. And there it is. Next to her nightstand and that awesome lamp we picked up together a couple of years ago. Happy birthday and happy reading, love you Mom! That is so wonderful and touching. Way to go. Your gift will touch many, a gift, that brings tears to those that know Mr. Darcy words.